bad mom: whose child is this? My son competed in the district track meet this afternoon. If you've followed my stance on exercise at all, you understand what a strange choice of activity this seems for him. (My dear husband was a swim team demi-god and continues to go to the gym without coercion, but our son generally tends to take on my traits. Until today). 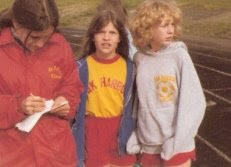 My favorite teacher, Miss Baker, was the coach and my friend Debbie begged me to join with her. I probably bitched every single day about the cold and the shorts and the running. Because I sure would now. So glad the boy has got a few of his dad's genes going on. Seriously, there's nothing like watching your kids play sports (or play in band, etc.). My husband's a runner. I. Don't. Get. It! It was a fun event, although we stayed until 6:30. Sigh. Yeah, you look real happy in that picture. You and Stu make some beautiful kids. Congrats for that jump! He's got some groovy camouflage track pants! And he's got cute genes from you both. Nice job. I hear you. I'm a total klutz, and thank GOD my son inherited his dad's athletic ability (and build, as opposed to mine). I am proud that Mr. Perfection did alright with his not first place ribbon. He did his very best and had a good attitude. You got yourself a little "mini Me"!! Very cute!!! As my hub (aka Mr. Music) is the "anti sports" kind of guy, it's up to me to be the sporty influence....I'm doing my best, but...damn....I'm tired..and if I'm holding a margaritta (in a plastic cup, of course..I'm all about safety!) it makes it really hard to play catch!! ~~sigh~~ Can I rent a sports influence somewhere who would be willing to travel internationally?? I'm with you. I often wonder where my kid found the sports genes. And seriously, if I tried a running long jump in pants as long as your son's? I'd have face planted about 2 inches into it. mason and the hurdles. truly awesome. and you? how cute are you? even if you were bitchy about it.